hi folks i was here over a year ago when designing and building the sandwich200 (based on the Fusebox) - i had to move and focus on a crowd-funding campaign, which i am now dealing with so i need to get back onto the 3D printer and make 10 of them, so as to have a small factory to make the parts for the crowd-funding campaign. initially i was going to buy 10 cheap china-sourced 3D printers and have them shipped to where i am living in taiwan: turns out that the exact same printer i (mistakenly, naively) selected is one that people have actually had experience with here, so i've made a report: [forums.reprap.org] but the experience with that printer was so awful that i'm just going to have to return to a complete redesign of the Sandwich200. to use the advantages of the Rikadenki Scientific Plotter XY arrangement to double the accuracy of the printhead movement. as a result of having *two* pulley sets (one for X, one for Y) the printhead will be on a free-floating independent assembly that will need to be supported by four rods (two for X, two for Y). to have the free-floating assembly be on solid square bar rods with triple v-slotted bearings per rod (yes that's a lot of v-slots: 12 in total), spring-loaded on the middle one to ensure even pressure. experimentation with aluminium 8mm bar and solid carbon-fibre bar will be tried out. Flex3Drive's "Direct Drive" adapter will be a drop-in optional upgrade, providing an automatic 40:1 improvement on the gear ratio for the hotend as well as bringing in the advantages of both the direct drive *and* bowden worlds, and removing all the disadvantages of either. optionally experiment with 2mm hardboard or even as low as 1mm acrylic or lexan sheeting on all sides in order to provide additional rigidity to the frame. it's quite a big shopping list of things that i've learned over the past couple of years, and from being used to chris palmer's excellent engineering experience which went into the mendel90: that's the benchmark i'm comparing against. the risky bit is the experimental plotter arrangement, but with many people having successfully worked on CoreXY and other arrangements, nobody is triyng anything new which would advance our knowledge of 3D printing, so i am happy to give it a shot. i will also - despite the list of components (six linear rails, three lead screws, Flex3Drive) try to keep the build cost down by sourcing everything here in Taiwan. i'm in the right place, so might as well give it a try. also as i am to be making TEN of these printers (if successful! ), anyone else who would like to join in a group buy of the parts would be most welcome, when it comes to it. comments and discussion welcomed warmly. it's a double pulley arrangement that acts on the furthest extents of the twin rod holders (which are mounted on linear rails), such that the force is not only quadrupled (by the twin pulleys) but also it is equally balanced. 4x and 2x shows the multiplier effect on the belt speed due to the pulley arrangement: the parts of the belt at the very bottom are fixed and thus do not move at all. in one of the earlier sketches i made the mstake of putting the NEMA17 for the X belt down in the bottom left corner: in *theory* any one of the idler positions could be a NEMA17 gear position instead, but i realised that the bottom left corner would result in a "pull" on the bottom left carriage idler also creating a resistant "pull" on the *right* bottom carriage idler, that then made the belt go slack on the top right idler.. bottom line is it would create a torquing moment on the carriage. so it really is quite important to have the NEMA17 where it is. it's not perfect by any means but i really want to see if it works. Edited 1 time(s). Last edit at 05/29/2017 11:01AM by lkcl. Is limited XY resolution really a problem? Using a 400 step per rev motor would double the resolution of a standard 200 step/rev motor without all the extra hardware, but if the printer's frame isn't super rigid, higher drive resolution will be pointless. 20x20 t-slot isn't going to be super rigid unless the printer is very small. You're bending the very long belt around 10 pulleys. There's bound to be some non ideal behavior there- pulleys aren't lossless, belts stretch, and pulley axles tilt when belt tension is applied. Guide rails flex, and bearings have play, too. This is probably one of those situations where you'll have to build it to see if it works. i was going to use 400 steps/rev anyway i wanted to look at putting in enough gearing to consider dropping to coarser microstepping... or just to have better control over the print-head, as well as not have so much force on the belt, to achieve the same effect. am i right in thinking that for a pulley the amount of force per belt section is less than if you applied the same pull directly? so in this case the fact that the belts are quadrupled would mean that the force *really is* four times less than if you had a straight normal cartesian arrangement? normally if you use gearing (closed loops like in the ultimaker) or if yyou have 400 steps / rev motors you *still* have the same amount of force applied, but here, thanks to the double pulley, the force per belt section is, i believe, *four times* less. but it does have to be said that it will also be four times faster speed (or twice in some idlers) so that could be a potential problem (belt inertia as it whizzes round the idlers at 4x normal speed). but if the printer's frame isn't super rigid, higher drive resolution will be pointless. 20x20 t-slot isn't going to be super rigid unless the printer is very small. the top i still haven't entirely worked out because i may have to "offset" the left and right extrusion for the XY carriage (X being 20mm higher and mounted on top of Y), which complicates things somewhat when it comes to a rigidity analysis. if i can put them into the same plane it becomes much more straightfoward: brace them with a plate of some suitable material, with a hole for the extruder to poke through. *thinks*.. the belt length should only be around 1.8 metres: 300mm appx, times 6. left-right-up-down is times 4, and the doubling-up is 2x so that's a total of 6x 300mm appx which comes out at 1.8 metres or so. the rails flexing... i hadn't thought about that. damn. good call, dd. ahh did i say a cross-arrangement for the cube bracing on all four sides? i did, didn't i. hmmm.... i might have to use picture-frame (like on the ultimaker-2 front) to give some up/down bracing to the 2020 that the rails are to be mounted on. or another flat piece (80mm deep), attached horizontally, along each of the 4 2020 struts. i'm reluctant to go for bigger than 2020 as it's so cheap here in china, and this design is to be part of a build farm (not a one-off). as always, great to hear your thoughts, dd, i always value your insights and experience. Edited 3 time(s). Last edit at 05/29/2017 12:29PM by lkcl. ok so this is progress so far in adapting a pre-existing design over to the new double-pulley plotter arrangement. quad 6mm rods and quad MGN9C rails with two blocks per rail are proposed. i am trying to keep to 300mm long 6mm rods and rails, so the frame (2020) will be a 340x340 square. this to ensure that bend/flex in the 2020 extrusion is not excessive. it does however mean that space is particularly tight. the carriage has its corners cut off so that the rod-holders do not smash into the carriage at the extreme extents of travel. assuming a 216x216 travel there is literally half a millimetre clearance each side. 214x214 is usually the minimum for a standard printbed (200x200 with 7mm clearance) so it's not that bad. on the top of the carriage is space for 2 25mm fans. it is actually possible to fit a clip round the E3Dv6 but space is so tight that i wanted to try something which i've not seen before: air ducts down through the carriage, such that it is not necessary to mount the fans *underneath* the carriage (where they will be in the way, anyway). the purple bit i've tried to analyse properly, in combination with the carriage base, to make sure that it's sufficiently rigid: also, i realised that the centre of gravity of the whole extruder assembly needs to be around the middle of the carriage (height-wise), because when it's being thrown around if it's off-centre from the height of the rods it would result in the carriage being torqued. previously i thought it would be sensible to raise the extruder nozzle to be as close to the rods as possible, but i am reconsidering this in light of the importance of keeping the extruder assembly's *centre of gravity* as near to the centre of the rods, instead. so i added simulated belts (sections of rectangles), which has allowed me to get the idler locations correct, both in the x-y ends as well as the motor holders and idler holders. it's a really complex belt arrangement.. if it is also desired to keep to a compact design. a single belt is fine (like in the first image) but two is where it gets hair-raising. i'm having difficulty working out where to put the belt attachment points for example. anyway the above is a thoroughly boring video of a design walkthrough on the XY arrangement. I've also tried to show the carriage as well. finished the x and y motor supports. the purple (top, x) belt is stacked over the red (bottom, y) belt, and the y belt begins (clamped) in this corner, where in the opposite corner it's the x belt that starts there. second idler: this one does not have the belt clamps, it has both belts crossing over (hence 4 idler bearings). again the T-junctioning can be seen from the underside view, and the stacked nature of the idlers from the overview. the cut-off on the corner is not just decorative but allows access to the idler bearings to make threading the belts easier. considerable care has been taken to ensure that it is actually possible to insert the bearings into their idler positions! first idler. this one has both belt clamps for the x and y opposite ends (to the motor holders). structurally this idler is particularly complex so as not to have to be made from a solid block of material (that would have been a lot easier to design). the complexity comes from having to hold two stacked belts sets of idlers, two stacked belt clamps, retain structural strength and integrity whilst at the same time not interfere with the X-Y rod holders when they are their maximum extent. unfortunately, none of these parts can be designed to be easily 3D-printed: they all require underside support as there is significant overhang not just at the start but also internally. it's just the way it goes. ok so this is the main frame, i intend to use laser-cut acrylic in a cross pattern in each face. what i will do is place something in between each of the cross-braces on each face, pushing them apart and creating tension. without that tension the face would be slack. the nice thing about this idea is that the tension is equal on both acrylic braces of any given face. next will be the z-assembly and the printbed. Are you planning to make the corner pieces with all the pulleys and motor mounts using a 3D printer? for a first version yes. i have a time constraint as well as price target to meet (so that i can make as many of these printers for a fixed budget of $USD 3000 as possible). the primary purpose of this printer is to be part of a build farm that maximises mm/sec per dollar. i'm aware that you're a big fan of making things out of aluminium (particularly 40x40 box section), which is something that i respect enormously - however i don't have a workshop attached to this apartment and i want to test this new concept - rapidly - without high cost. 3d printing the idler and motor points is the quickest way to do that. worthwhile pointing out though that the corner joints between 2020 section will most certainly not be 3D printed. as i will be using acrylic for the actual bracing i only actually need to make sure that the 2020 is stiffly joined together, so am considering using those otherwise-completely-useless L-shaped inserts (the ones that go into the 2020 internal slot). Edited 1 time(s). Last edit at 07/05/2017 10:28AM by lkcl. The reason I ask about 3D printing the parts is that with multiple belts and pulleys and motors, there is going to be a lot of mechanical force on them and they look to me like they're going to flex a lot. Using the first and second CAD renderings you posted as an example, you have a motor mounted on a thin plate with some equally thin plastic reinforcements. How did you determine the size and number of reinforcements to use? As you have seen, I have a tendency to over-build things and if I were going to print them, would make those parts big and blocky, like a piece of Soviet era Russian farm equipment, just to be sure that they aren't going to flex enough to cause problems. I'd approach it like I'm going to mill the parts out of a solid billet of metal, and take away just enough to fit the pulleys and motors, etc. If I were trying to test a precision mechanism, like your complex belt and pulley system, I would try to minimize all possible failure modes and weaknesses so that when I look at the performance of the system, I know that I'm seeing what the system is capable of, not something that has problems because the plastic parts are flexing and the belts are all rubbing the pulley flanges, etc. Blocky parts can be a easier to print. Carving back the bulk might come in the second or third rev (and you will be doing two or three revs). I think I'd try to take more advantage of the stiffness that the aluminum frame can provide instead of standing everything up above it and relying on the plastic, but maybe it isn't possible with the way the belts have to run. you're right: the belt positions are a pain. unlike investment advice they can only go further up, not down. if they go further in then it's a near-total redesign job. 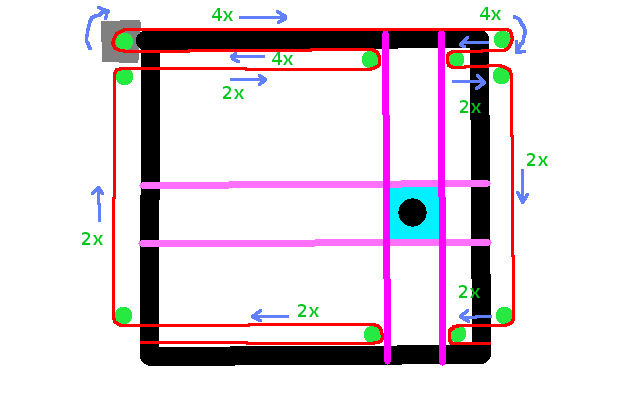 the only other option would be to add a second set of outer extrusion, for outer dimensions oft around 430x430mm. mentally i kinda rebel against this as it seems to be an extortionate waste of space, given that the printbed is only 200x200. currently the full extent is about 370x370 and even that i'm squawking about. you've prompted me to do a more thorough review, i'll do a video tomorrow. the motor mounts in particular as they stand have a chance of twisting, due to the way they're attached to the sticking-out-bit of extrusion. pull from the belts is something i'm relying on (and have bracing in place... but not enough). My coreXY machine is 610 mm wide (including enclosure) x 580 mm deep and has a 300x300 bed. As long as it will fit through a doorway (it does) and into my car (it does) I'm OK with it. i have to take mine on planes. first time will be to take the prototype to shenzhen maker faire, which is the 10th-12th of november. basically for all four corners i need to create slotted covers that wrap all the way round the protruding part of the 2020 extrusion. that's the summary, anyway. okaay so this is the first modification to the xy motor holders: extending the piece flush with the extrusion (near the bolt) then adding a third triangular bracing. also on the underside you can see a new triangular part which creates a tube that the extrusion slots into. the third bracing supports the tower with the belt (red)... actually it supports the 5mm thick floor that the tower is on. i explained in the video above: a force from the belt causes the tower to pull sideways; that in turn causes the floor to bend downwards; the third triangular bracing causes that downwards-bend to transfer into a side-ways load against the extrusion; that in turn is prevented by the extrusion and so, consequently, the tower cannot move. here is another screeenshot from the other side, again showing the new underside triangular bracing. the newly-formed "box" around the extrusion basically means that the front-side triangular bracing that can be seen flush against the NEMA17 is now effective at doing its job (bear in mind there's no bolt there to hold that wall against the extrusion, all the way behind the NEMA17). so the forces from the belt cause the entire floor with the NEMA17 to try to lift and rotate upwards; that force is transferred via the front-side triangular bracing into a sideways shear, which, thanks to the underside part is transferred into a pull AGAINST the OPPOSITE side of the extrusion (the bit that has the bolt in it, visible on the left). as that can't happen, the floor cannot move either. also as you can see i didn't like the block that is like... 11mm wide at the end of the extrusion, so i turned it by 45 degrees, put a hole down the middle, effectively turning it into triangular braces. the reason for doing this is not so much to save bits of plastic but to allow access from both ends of that extrusion-hole. the reason for _that_ is because there is going to be a heck of a lot of bracing created by the slicer program, and i'll need to clean that out properly with keyfiles. anyway *both* motor holders are now done, the other one automatically, because i am using python and pyopenscad, this is entirely parametric, and the same Object-Orientated class is used to create *both* motor holders as a single OO function. now for the idlers. Edited 2 time(s). Last edit at 07/07/2017 04:16AM by lkcl. taking shape, sorted out the frame, added a representation of the printbed. also as i have about 60% of the parts (rails, rods, bearings) i've begun 3d-printing the parts, starting with the carriage and x/y-ends. the blocks (front left, back left) clamp the rods down onto the x/y-ends. the holes that you can see (diamond-shaped) are a plastic-saving efffort but also it gives the design a distinct look which i kinda like. How did you determine the size and number of reinforcements to use? ok i thought it might be worthwhile specifically answering this question. generally i try to take advantage of compression rather than tension, as well as the strength of anything that's metal (just as you suggested). so, if i need to add a triangular support, if it's under tension (pull) i will make it 3mm wide, and if it's under compression or is particularly small (only say 10mm x 10mm) i'll make it 2.5 or 2mm wide. motors in particular are stiff (made of metal, duh ) but i tend to put at least a 5mm or 6mm flat plate on the top over to the screw holes (+/-15mm in each of x and y for a NEMA17). i also now go with 40% infill. basically it's a hugely iterative process of "is this supported, will it flex yes no, yes ok connect something at right-angles to it that goes to something-else-at-right-angles, will _that_ flex yes no" repeat repeat repeat... but also taking into account that under tension the plastic could rip itself apart. had it happen... *sigh*. eventually it's necessary to use screws to connect the part to actual metal: for strong parts i try to use a minimum of three as far apart from each other as possible, and making sure that if there is some tension that would pull the screw *away* from the metal, it's a thick attachment panel (5mm) and that there's bracing either side (no more than 6mm away from the screw). i don't like this scenario so try to avoid it happening. sideways shear is fine: for that i tend to use 3mm thick attachment panels. no less than that, and i always put a "runner" protruding 1mm into the groove along the 2020 so in effect it's actually 4mm thick where the screw goes through to the T-Nut. also i use 1.75mm diameter holes for M3 screws, and a 5.0mm hole for M5, but then i use the "tapping" technique to insert them: 1/4 turn short-pause 1/4 turn short-pause REVERSE-1/4-turn short-pause, repeat until fully in, and that will drill threads into the plastic *without* breaking (splitting) the layers apart, particularly if the hole happens to be stratified in layers orthogonal to the screw. if you do it fast enough it actually heats the screw up enough so that within about... 10 seconds the heat of the screw helps to melt the plastic, greatly reducing the risk of splitting. Edited 1 time(s). Last edit at 07/15/2017 09:43AM by lkcl. Obviously, would benefit with a stacked belt arrangement, like the C bot. nnniiiiiiice! i reaally like that. let me try to get my head round it. ok, so belt starts at top green block, ends at bottom green block. so, trace the path: start from block, go round corner-idler, onto yellow x-end, where you get a single-pulley multiplier effect. belt goes twice as fast from that point onwards, also load is distributed (half-half) on each belt section. goes round idlers and motors then onto other yellow x-end, where, due to the fact that beyond this point the belt is fixed the belt speed is halved back down to single-rate. so it has a doubling effect from the pulleys (the riki200 has quadrupling) - that gives a lot of advantages over standard designs, reduced belt force for the same amount of acceleration being one of them. it's also a core-xy... let's check... mentally "pull" on the two outer belt sections, due to symmetry the yellow blocks move "up", head moves up too, that's ok. ok now for left-right.... which is doing my head in ok let's start by moving the extruder to the right. right-section belts shorten, left motor goes anti-clockwise (blue belt), right motor goes... anti-clockwise too, yay! ok the belt arrangement i consider to be like the "reference platform" for stacked belts is the Fusebox (sadly, nothing else about the design is very good, *except* for the belt arrangement, which is absolutely superb). the reason for stacked belts is because then the "pull" from the belts, particularly on the x-end (yellow) blocks are evenly matched. one of the problems with the H-Bot is that the forces are not properly balanced under acceleration, causing "torquing" (twisting) of the entire x-assembly. this *also happens with a core-xy* if you do not line up the x-end idlers directly one above the other. (you can make absolutely sure that you do that by using the same bolt). also there appears to be a belief that it's okay to change the height of each belt so that each belt is not in the same z-plane (same Z height), in order to avoid the belts hitting each other. again this is completely unnecessary if they're properly stacked (10 to 12mm between belt centres for a GT2-6mm usually does the trick, although 10mm can be hard to design the idlers). when you have changes in height (each belt not in its own Z-plane) what happens is that the belt tries to "ride" off the damn idlers. in one direction it will ride up, and in the other it will ride down. not only that but the tension is different throughout the entire cross-section of the belt! why? because the path the top edge of the belt goes through is *different* from the bottom edge! does this matter? hell yes it does! what i particularly love about the EtchXY concept is that it's symmetrical as far as weight distribution is concerned. the thing that bugs me about the standard CoreXY is the fact that one axis has to have the extra weight of a cross-gantry.... whereas the other axis does not. this was why i went with the symmetrical plotter arrangement over a standard CoreXY. ... it never occurred to me that the two could be combined! soo.... huh. i love the EtchXY concept enough to make it my next printer. one of the downsides of trying to do a small quad-pulley plotter style 3D printer is that the motors and idlers have had to be a *long* way out from the main frame. by returning to a more CoreXY-like design i know already (from the Sandwich200) how to make a compact design, get everything "inboard" and keep to a 340mm width by about... a 380mm depth. so... thank you! very inspiring. independent heads? dang! you could do simultaneous printing with that, and double the speed but keep the quality of lower-speed extruding. btw have you seen mutley3d's dual-filament extruders, that flexion extruder is a hell of a lot of weight to put on a single assembly, the flex3drive dual-extruders the two filaments mix inside a single hot-end *and* the "direct" driving is moved to a static location using an automotive grade flexible driveshafft and a 40:1 wormdrive. awesome bit of extremely thoroughly researched engineering kit. The Flex3Drive is an awesome innovation, especially the Duo. IMO, the Prometheus System may have an edge on filament swaps for a single nozzle. Yet to test my Prometheus hotend (not the system), soon, still building. You're correct about the Flexion mass, which is why I was looking at a dual cross bar solution. Still stuck in Makerbot land at that time, so was comfortable with that style direct drive extruder. Then hit on CoreXYU, which remedies some of the some of the negatives of a standard CoreXY. I like you're using rails, instead of rods for the outer guides, should make it beefy. Your printer design is unique, my compliments and encouragement. Are you planning on using a Flex3Drive? Edited 1 time(s). Last edit at 07/23/2017 02:45AM by prot0typ1cal. wow i love that it's built from... is that laser-cut acrylic? so you can see what's going on inside, if there's any problems. filament buckles or doesn't feed properly... i like that idea. talking to jason about filament retracts (for swapping) i have a vague recollection that it's ridiculously fast. correction on what i said earlier btw: you know how it is, wake up in the morning and the first conscious thought is, "whoops i made an analysis error on that 3D printer EdgeXY design". run-of-the-mill, everyday occurrence that everyone has, y'know? anyway: there isn't a doubling-effect from the EdgeXY because both ends are "free" not fixed. so what pulls on one side pushes on the other. now if you had *two* bearings per block per belt then if i recall correctly from the wikipedia pulley page you would get a 3x force multiplier effect (because of the 1 "free end" plus the 2 extras). but that's a total of eight extra bearings... might be worth considering though! i do like properly geared extruders: the direct-drive ones basically we're redlining (maxing out) the capability of the motors and steppers. not good, really! there's only the one main design risk (present in the EdgeXY as well): rotation of the entire carriage and associated rods *and* the X/Y-Ends. basically left X-End goes up, right Y-end goes down, top Y-end goes right, bottom Y-end goes left, the whole thing rotates about the Z-axis and you're hosed for accuracy. i'm *hoping* that the fact that there's two rods would, if there was any rotation about the Z-axis, cause attempted side-loading of the MGN9C blocks against their rails, which would resist that and thus minimise rotation. shearing i *really* can't do anything about unless going to metal X/Y-Ends, and clamping the 6mm rods down ridiculously rigid so that the only way for them to shear would be to actually bend the damn rods. just have to see how it goes. i have a G2 (made and bought 2 years ago) and i love it. it's exotic, awesome and a fantastic concept. it's not as light as say the KosselMiniFlex3Drive which i really should have got: dang that thing is small. the core benefits of a Flex3Drive are that: A it combines the best of *both* DirectDrive *and* bowden.... with the disadvantages of neither. B the 40:1 gear ratio means that you get far better control, much more "push" for a lot less current C you can use 8:1 or even 4:1 micro-stepping, thus reducing current usage yet again (down to the static losses associated with microstepping being far less at lower microstepping ratios). jason recommends you run with 8:1 or 4:1 micro-stepping and set the current to around 0.4A (this is for 1.75mm filament). so conceivably it could be possible to use a NEMA14 with it, but personally i'll stick with the NEMA17s as, with the stepper being static there's no driving incentive to use something that's not a stock/standard item. edit: recommend the direct-drive it's a drop-in replacement for a NEMA17. Edited 1 time(s). Last edit at 07/24/2017 01:58PM by lkcl. We have a solidoodle printer at the makerspace that had a laser cut acrylic extruder, similar to that prometheus thing. It was absolute trash. If you tightened the screws too much the plastic cracked. If you didn't tighten them enough they came loose. Stay away from anything acrylic. ok very briefly this is progress so far after the last batch of parts arrived this afternoon. several minor modifications required which will need reprinting 75% of the parts prepared so far (!) but that's about 16-20 hours so i'm going with it for now and want to try testing out this printer as it stands. whooops.... baad, thanks for the heads-up. hmmm... i was planning to use acrylic for the bracing and the printbed plate (5mm thick). what other material would you suggest? polycarb sheet? polythene? nylon? the bracing needs to be put under a _lot_ of tension. edit PVC. saw a CNC made from 9mm sheet PVC once. Edited 1 time(s). Last edit at 07/24/2017 01:56PM by lkcl. niiice - you mean PCB fiberglass! that's actually a really interesting idea. it's easy to get hold of and strong as hell. okaaay so i have the frame assembled, z-axis assembled, added some temporary frame-stiffening brackets.... tested out the belts aaaand discovered an unanticipated show-stopping design flaw. if i was, for example, an engineering student of a university i would have been asked to do the force-balance analysis in advance and would have spotted the problem. the problem is: the 2x pulley and the 4x pulley are on opposite sides (separated by 320mm). what happens, therefore, is that when the motor turns you get *twice* the force pulling on one side than on the other. what that does is create "lag" on the x/y-ends, and the whole assembly shears sideways. one x/y-end is pulled harder, that causes shear, and it's only when the force of the rods twisting in the plastic joints is builds up high enough that the *other* x/y-end starts to move. this is very very bad, so i cannot proceed with this design. it is not helped by the fact that the MGN9C rails are just that bit too small, so actually fall *into* the 2020 extrusion's middle gap on one side or the other, causing them to no longer sit completely flat. that in turn causes there to be an imbalance of frictional force on each rail. but, also, i discovered that the use of the 50mm steel brackets, whilst it can keep two 2020 extrusions at right-angles, does *not* stop those two extrusions from twisting about their centre (down the middle 4mm diameter hole). as the MGN9C rails are mounted *to* the 2020 extrusion, the rails *also* twist, causing changes in frictional force and damaging the blocks as well. the 2020 twisting i believe i can stop by using e.g. 20x40x40 cast triangular corner bracing that's properly designed for this task. however the force imbalance from the pulleys i cannot "design out". the only way to fix this would be to put in ultimaker2-style closed loop belts plus big pulleys. and if i was going to do that, i might as well make an ultimaker2-style 3D cartesian printer, and not bother with the double-pulley system at all. either that, or it would be necessary return to something more like the original rikidenki, with a single 2x-acting pulley mounted to the carriage, not two 2x-acting pulleys mounted to the x/y-ends. the x/y-ends would still be free to move independently, potentially resulting in the same "shear". i'm not prepared to risk that. so... mr prot0typ1cal, i believe i will have a go at replacing this borked design concept with the EdgeXY concept instead. it has the advantage that the forces on each of the yellow and green blocks is identical, i.e. that under acceleration there is no mis-matched 2x force imbalance. but more than that, it is very close to what i have, design-wise, so will not require a huge amount of modification. * push left yellow block "up", push right yellow block "down". this results in blue belt on left yellow idler trying to become LONGER (tension)... but *at the same time* because blue belt on right yellow idler is on the OPPOSITE side (top) it ALSO tries to become longer (tension, stretching). as BOTH parts of the belt cannot become longer, the result is that the twisting is RESISTED (i.e. cannot occur). * likewise for left yellow block "down" and right yellow block "up" except now it is the red belt trying to stretch. * similar for the green blocks except this time it is the belt fixing points doing the "resisting". * pull left side of X-gantry down, pull right side of X-gantry up. leave carriage in a fixed (central) position whilst doing so. entire X-gantry therefore rotates anti-clockwise. * red belt will move, red motor (bottom left) will rotate clockwise. * blue belt will *also* move, blue motor (bottom right) will rotate anti-clockwise. this illustrates that there is nothing to actually prevent rotation of the X-gantry (which is itself a major concern). * idler in top right corner rotates ANTI clockwise. right upper (vertical) red belt segment becomes LONGER. * idler in bottom RIGHT corner (blue belt) rotates *clockwise*, right lower (vertical) blue belt segment becomes SHORTER (to match the LENGTHENING of the right red belt segment). aaaand again there is absolutely *nothing* to prevent this from happening. the problem comes wheen the carriage is NOT in the centre, and the mass distribution is such that the left end of the X-Gantry (for example) is far heavier than the right end. under these circumstances the forces under acceleration are NOT EQUAL, which in turn will result in twisting of the X-Gantry... for which the standard Core-XY concept has no means of resisting. ... but in the EdgeXY design an unequal force distribution can indeed be resisted, both in the X and Y directions. ... did you know that this was possible, prot0typ1cal? had you any idea that you managed to come up with a design concept that fixes one of the main design flaws of the standard CoreXY design? Edited 1 time(s). Last edit at 07/25/2017 10:22AM by lkcl.